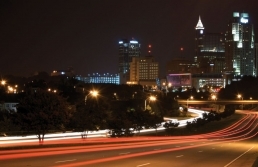 The research triangle that surrounds the Raleigh-Durham area of North Carolina is a burgeoning center of technology innovation in the United States. So it is no surprise that it also includes the ninth fastest-growing county in the country. And with that growth comes demand for electricity. One way to meet that demand is a combination of old school process and cutting-edge technology. Duke Energy’s Cliffside Steam Station Unit 5 pairs the tried-and-true coal-fired plant with a selective catalytic reduction device capable of reducing nitrogen oxide emissions by up to 80 percent. Currently under development, Unit 6 is designed to have among the strictest, most effective emission controls available. Once the new unit is on line, as early as 2012, Duke expects to retire the older units (1 through 4). That exchange will result in generation of more then double the electricity with lower emissions. Duke has further committed to even further reductions in older coal-fired generation, aimed at making Unit 6 carbon neutral by 2018. As a long-time member of Raleigh’s geotechnical testing community, we’re honored to be part of innovative thinking.